Welcome To Your New Internet! 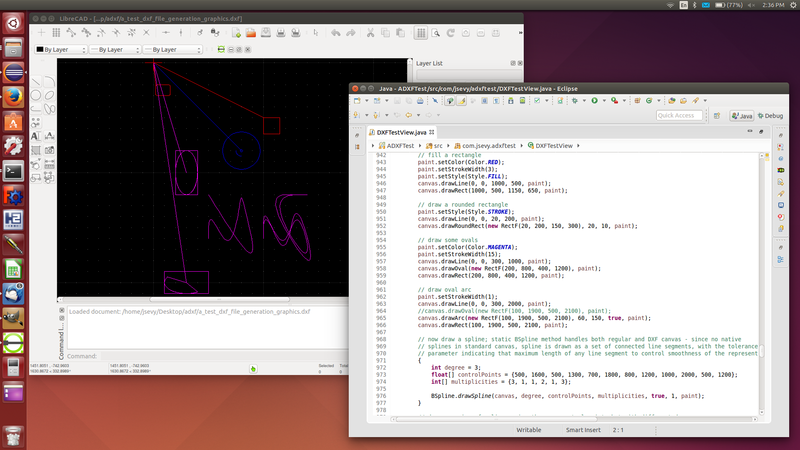 The Android ADXF library provides support for generation of DXF files for use with CAD programs using standard Android “draw” commands. The library provides a special Canvas subclass, DXFCanvas, that is associated with a DXF document and that renders draw commands into DXF syntax. A sequence of Android Canvas drawing method calls will thus create a structured DXF document that, when opened with a standard CAD program, will display the Canvas image as a CAD design that can be modified within the CAD program. This library is released under the MIT License. The class DXFCanvas implements the graphics operations defined by the standard Android Canvas class. To create a DXF drawing, you use the standard Android Canvas drawing calls (including drawing, transformations, etc.) on an instance of DXFCanvas. The DXFCanvas will encode these Android drawing commands as DXF objects in an associated DXFDocument, which can then be saved as a DXF file. The ADXF library provides most of the drawing operations available in the standard Canvas class. However, certain methods are unimplemented at present (some due to lack of support in DXF). These unimplemented operations will be ignored or throw an UnsupportedOperationException if used, as indicated below. Some additional features currently have no or limited support, as indicated below. The library provides methods for creating and drawing B-splines on the standard Java canvas, as well as generating DXF code for splines. Some example files generated with ADXF are at the links below. The Java source code used to generate these through the ADXF Library is available in the Example Code section. A test project is available that illustrates how to use the library and that can also be used to test its functionality. The downloads are supplied as gzipped tar archives; the library archive contains the compiled gnuapdf.jar file for inclusion in a project, while the source archive contains the Java source files that can be used to rebuild the .jar file or included as source files in a referencing project. The test app source contains source for a simple test app that uses the classes in the ADXF library. Version 1.1 adds DXF elements that are not strictly required by the standard, but are required in order to open the files in AutoCAD.